Deep Tissue: Helps circulate the blood throughout the body with deep pressure, releasing toxins, stress and relaxes the mind. In addition it releases muscle contractions. Aromatherapy: Aromatherapy is an art of combining pure essential oils (aroma) with the healing technique of massage; allowing one to relax & delight in the sensual world of aromatherapy. Pure essential oils, often referred to as the ‘spirit of the plant’ are hand blended by the aromatherapist. The oils are chosen for the client and based on aroma and medicinal uses. This blend will be used in a full body massage. Body Scrubs - Jackies Signature Treatment: Reflexology of the feet using aloe. Five natural herbs are boiled together to make a brew. You are scrubbed down with the brew using exfoliating gloves from head to toes, which detoxifies & opens your pores. Energy Balancing/Reiki: Energy is channeled through the practitioner connecting with the client and goes where it is needed. It brings about deep relaxation, dissolving blockages, detoxifying, relieving stress and restoring balance & harmony; which is our natural state of health. You can experience a tingling sensation, seeing colors or images, a peaceful feeling, crying or laughter, or just a restful sleep. Past Lives: An excellent way to connect to your higher self which facilitates you in realizing your spirit is eternal. It allows you to connect the lost pieces of the puzzle in your life as to why you have certain behaviours or beliefs. It sheds light on how to unlock the door to your future. Also to connect with old loved ones, ancestors & angelic guides, during astral travel into your past experiences. A deeply relaxing and moving experience. 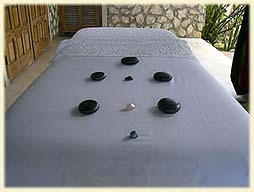 Hot Stones Massage: The heat of the hot stones increases the state of relaxation physically, mentally & emotionally. The use of the stones to hold heat enhances the healing properties due to the minerals from the earths energy. The stones are used in long stroking movements along the meridians to release tension. Live Cell Analysis with nutritional counseling: A pin sized drop of blood is obtained and placed on a microscope slide & then analyzed. Nutritional information is gathered according to what the health professional(certified microscopist), finds in your blood. Then a full nutritional analysis is given. NB- This is for nutritional information only, it is not a diagnostic procedure. 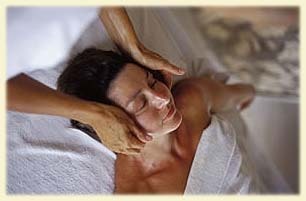 Facials: Facilitates in the release of stress from the muscles in the face. Increases circulation and rejuvenates the face. It improves hydration and skin tone, while it exfoliates; in addition to restoring the natural PH balance of the skin. Reflexology of the feet & hands are included. Other spa services available are Manicures/Pedicures and Ear Candling.